Fifty-some years ago, when I was a young buck working on a farm in Eastern Colorado, I learned a simple truth that ultimately had a profound impact on my life. My boss, Malcolm Shipman, was a diminutive Texan with a big heart. He and his wife, Judy, never had children of their own, but befriended every kid in town and always took in the stray cats, dogs and horses. Though they rarely rode, Malcolm and Judy often bought horses, if they felt the animals were being mistreated. One hot summer day, Malcolm and I were in town to pick up a part for his combine. At the John Deere dealer, Malcolm paid for the part, then bumped into a friend, as we hustled back to the pickup. Arms draped over the pickup’s side rails, Malcolm and the farmer proceeded to yak for almost an hour. Knowing my boss was anxious to get that combine ready for wheat harvest, I couldn’t believe Malcolm was wasting time just shooting the breeze! I guess my impatience was far too obvious. Driving back to the farm, Malcolm pushed his hat back and drawled, “Mr. Bill, people are important. Real important.” I humbly agreed, but nothing more was said. Malcolm just let those simple words of wisdom sink in. Months later, I learned the rest of that day’s lesson—The Boomerang Principle—when our small town’s fire whistle blew on a Sunday afternoon. Not unusual—until it sounded a second, then a third time. That meant the volunteer fire dept. had a big one on its hands and needed more help. Our family-of-six jumped in the car and headed for a huge column of smoke billowing north of town. A long stack of hay bales was burning at Malcolm and Judy’s place, threatening nearby outbuildings. Over the next six hours, about half the town’s citizens fought that fire, trying to keep it from destroying a horse barn and spreading into surrounding pastures. Evidently, the fire was ignited by spontaneous combustion, thanks to damp bales buried deep inside the stack. It took hours to literally tear that tall mound apart and extinguish the flames. 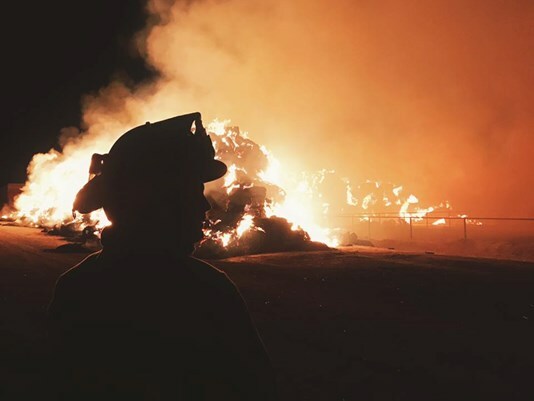 Tractors with a cable tied between them drove back and forth, slicing through the bales and exposing smoldering hay that firefighters hosed down. Everybody onsite knew this was going to be a long fight. Soon, it became clear that the sole fire truck would have to replenish its water supplies. That meant running back to town. Then small-town miracles started happening. A neighbor pulled into the Shipman’s yard, dragging a trailer loaded with a humongous water tank. Seeing the persistent smoke at Malcolm’s place, the farmer correctly assumed that a fire truck’s onboard tank would be running low. Consequently, he filled his stock-water wagon and drove over, precluding the fire truck having to make a time-eating trip to town. Late in the afternoon, women and kids arrived with cold drinks for the firefighters, which now included dozens of volunteers from town and the surrounding countryside. As the Sun kissed the horizon, folding tables blanketed with sandwiches, salads, hot coffee and freshly baked pies magically appeared. Although it was spontaneous, that potluck dinner couldn’t have worked out better if it had been planned for weeks. Firefighters took turns grabbing a quick bite, then went back to hosing, scattering and pounding, using rakes and shovels to expose and kill hundreds of tiny fires that dotted the area, after the stack had been torn apart. Everybody knew what had to be done…and did it. Somewhere around 10 p.m., the fire chief declared victory. Every lump of blackened hay had been drenched, ensuring no flare-ups later that night. One by one, bone-tired firefighters drifted off and headed for home. One of the youngest volunteers, I was thoroughly whipped, but felt good about what we had all accomplished. Reflecting on the long firefight, I recalled Malcolm’s simple words—”People are important”—and the corollary to his wise statement hit me: The Boomerang Principle. When you treat people with respect, like Malcolm and Judy always did, those same folks will be there for you in times of need. All those hours Malcolm and Judy had invested by talking to and helping others were repaid with interest on a Sunday afternoon, when dozens of friends and neighbors showed up to combat a fire that threatened the Shipman homestead. The boomerang of their good works had returned tenfold.